True to our nature as the generation of technology we use the web to search for answers on anything from medical diseases to what to wear to a wedding, if we are not looking for the terminal disease we might be dying of when our throats are scratchy or considering to wear white to a wedding you might find yourself looking for answers to your K53 Car Questions when you have your learners permit and you're looking for more information on what you can expect when you start driving a car. Do not waste your time searching endless web pages, we have all the answers you need. Must The Learner Driver Take Driving Lessons From An Official Driving Instructor? Must The Test Be Completed In A Driving School Car or Can A Personal Vehicle Be Used? If The Identity Document Is In The Learners Maiden Name Can And The Learner’s Is In The Married Name Can A Booking Be Made For The Driver’s Test? Can A Driver’s Test Booking Be Postponed? If The Car I Am Using Has A Crack In The Windscreen Will I Fail My Test? If The Motor Vehicle Is Enabled With Reverse Sensors Can You Use Them During The Test? Do I Need To Bend Down To My Knees During The Pre-Trip Inspection Of The Car? Is A U-Turn Part of The Required Actions During The Driver’s Test? Is The Driver Allowed To Exit The Vehicle Which Will Enable Him / Her To Verify The Position Of The Vehicle Before Completing The Manoeuver? When You Perform The Incline Pull Off Are You Required to Use The Handbrake And Remove Your Foot From The Brake? If A Traffic Light Turns Amber When Driver Have Almost Entered The Intersection During The Driver’s Test What Is The Appropriate Action? Are Penalty Points Awarded For Not Stopping At A Pedestrian Crossing During The Test? Can The Driver Re-Book Their Driver’s Test If They Fail The Driver’s Test Or Is There A Gap Which Needs To Be Taken? When A Driver Moves To Another Country, What Are The Procedures Which Need To Be Followed In Order To Receive An International Driving Permit? There are no legislations in the National Road Traffic Act of South Africa which requires a learner driver to take driving lessons when preparing for your driver's licence (but you will be required to have a learner's licence). It is though better to learn driving with a registered driving instructor as they will prevent you from learning bad driving habits. The driver can use any vehicle of their choice for the test as long as the vehicle is roadworthy. Contact your closest testing station to enquire about their policies regarding name changes. Millions of vertebrate animals are killed–each week–on U.S. roadways. In order to enquire about the necessary procedures, contact your closest testing station regarding their processes. It is advised to take the car to a roadworthy testing facility and ask them to check the windscreen in order for them to advise whether the car will pass the roadworthy inspection based on the cracks extent. This measure will not, however, ensure that that the testing officer will agree during your test. There are no laws which focus on forbidding the use of reverse sensors during a test. If you are refused the remainder of the test due to the use thereof sensors by the traffic officer you can lodge an appeal against him or her. As the inspection takes place in the yard you physically have to perform the checks, you can not mention the performance of the checks if you do not carry them out. In other words, you have to bend down to your knees to ensure that there are no obstructions under the road. The u-turn as we know it is not a part will not be tested per-say. The action is though tested through the three-point-turn which is alike in action the difference is that it is performed on a road which is too narrow to turn without having to stop at a kerb, reverse and then complete the action. 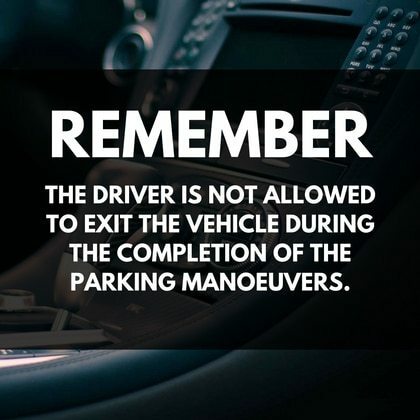 The driver is not allowed to exit the vehicle during the completion of the parking manoeuvers. It is not a test requirement that you need to remove your foot from the service brake when you have stopped, the examiner, however, can insist that you place the vehicle in neutral, apply the handbrake and remove your feet from the pedals. This action is to ensure that the handbrake is able to hold the vehicle still without the support of the foot brake as the car is deemed unroadworthy if it rolls backwards. The use of a vehicle which is not roadworthy will result in an immediate fail. Provided it is safe to do so, the driver is expected to stop behind the white line when facing a steady amber light. You will fail your driver’s test for breaking the rules of the road if you neglect to stop at a pedestrian crossing as required by the rules. The driver can rebook the test immediately if the test is failed - that is the great things about doing your K53 licence, many people fail, but it's not the end of the world! Passing the test in a manual transmission vehicle will allow you to drive both a manual and automatic vehicle, whereas passing the test in an automatic transmission vehicle restricts you to driving an automatic vehicle. The driver can contact AA who handles international driving permits, they will be able to assist in the process. 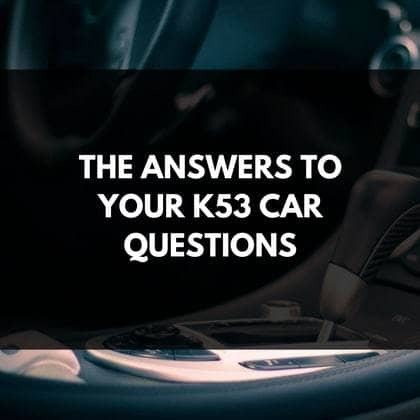 If you have any more questions about the K53 car test contact us. We know all the information which you require to pass test and more. Don’t spend hours on the internet when a simple call to us can save you time and data. Why not view our article on The K53 Failure Items Are A Need To Know, We Know What You Need To Pass The K53 Motorcycle Test, Simplicity Is The Key To Passing The K53 Yard Test or Do You Want to Know What The SA Rules Of The Road Are.